New Delhi, 5th August, 2016. 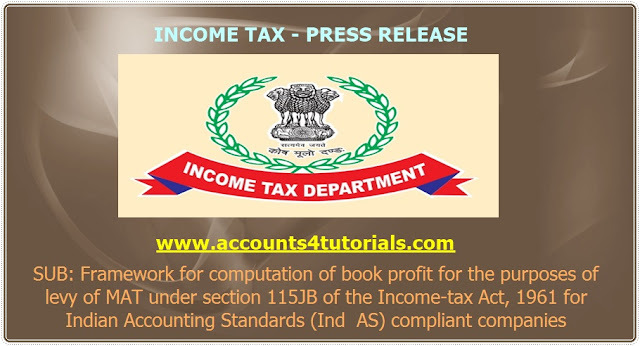 Subject: Framework for computation of book profit for the purposes of levy of MAT under section 115JB of the Income-tax Act, 1961 for Indian Accounting Standards (Ind AS) compliant companies. A Committee had been constituted, with the approval of the Finance Minister, to suggest the framework for computation of book profit for the purposes of levy of MAT under section 115JB of the Income-tax Act, 1961 for Indian Accounting Standards (Ind AS) compliant companies in the year of adoption and thereafter. The Committee submitted its report dated 18th March, 2016 regarding the said framework.